A perennial, shortly creeping species up c. 2 ft (60 cm) tall with very narrow leaves, and bearing pale lilac snapdragon flowers veined with violet and with an orange spot on their lower lips. This is an introduced species, long-established at Killowen (square J11) in Co Down where it grows on the sea shore on sandy ground among typical native seashore species like Beta maritima (photograph shows both species). 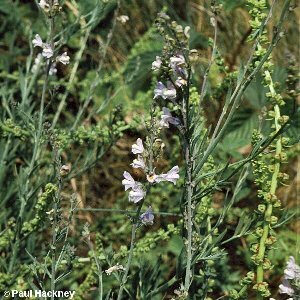 Formerly, the hybrid with the native Linaria repens was recorded from the same site, but it is not there now. Records from other squares either represent casuals or are old sites from which the plant has long gone.